The CRM software leads users to success - with systematic, freely definable processes. The workflow is set up with the help of a graphic designer. The processes are controlled efficiently by reporting. GDPR requires companies to work in compliance with certain data protection regulations. Non-compliance can lead to up to 2 million Euro fines. Work in compliance with these regulations regarding personal data with the CRM software AG-VIP. Manage advertisement consents efficiently. Every company is in a different situation. Marketing, sales and service must fulfill different requirements. The CRM software AG-VIP can be adapted just as individually. Call centers work with the CRM software AG-VIP since the Eighties, inbound and outbound. Market researches are made, demand situations are identified, customer dates are organized or service requests are processed across all channels. In 1979, Klaus Grutzeck invented the first software for contact management in a team. 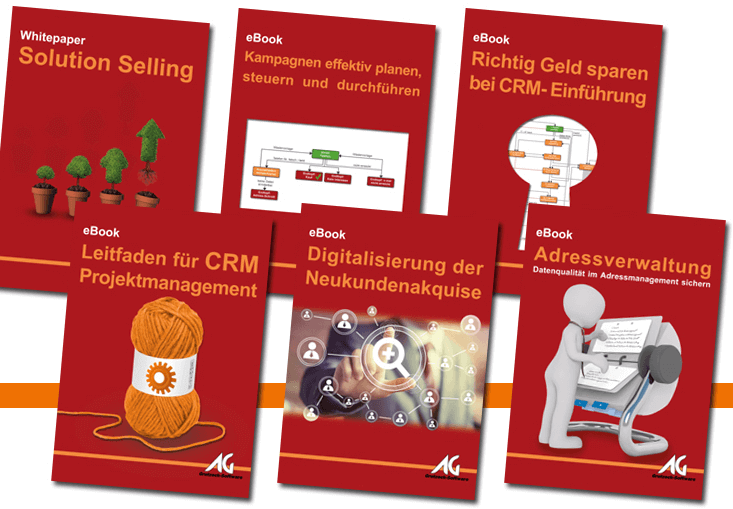 Since then, companies in all industries profit from more that 1,500 CRM implementations of the Grutzeck team. With this CRM software you use not only outstanding, but also awarded software: Multiple innovation awards from the “Initiative Mittelstand” (mid-tier initiative). Nominated by the “Deutsche Callcenter Verband” (German call center association) in 2014. Rated as “very good” regarding the customer satisfaction by benchpark.com, certified by Microsoft for the respective current Windows operation systems. The system saves times and creates more freedom for contacts and customers. "With your CRM-Software AG-VIP SQL we are very pleased and have them eagerly in use." "The amount of work (number of target customers), we were able to launch the CRM and call center software by more than 55% increase. The increased number of call attempts were up to 25% more goal to reach customers. This automatically increased the number of agreed customer deadlines (compared to similar themes)." "The issue of CRM is for us as well as craft and Management and more important," says Karsten Beardi. "The contact history of the used CRM-Software AG-VIP SQL offers us excellent opportunities to document the construction progress. Photos and documents we link directly. So we can inform the customer at any time, which we attributed to the construction site found to damage and what measures we have taken. This service is something our customers appreciate." "Expectations of HORIBA Jobin Yvon GmbH to the CRM Tool AG-VIP SQL have been fully met. And note 1 for the strict product development by Grutzeck Software GmbH and the cooperative support with any questions, problems and suggestions."